Jimi Hendrix made three albums while he was alive, and has managed to release 40-plus more records since his death. And now he's back, with over an hour of studio recordings from 1969 (with a few "finishing touches" from band members circa 1987). The selections include covers ("Sunshine of Your Love," plus Elmore James' "Bleeding Heart") and a mixed bag of originals you've mostly heard before, only not in these exact versions. Of the 12 cuts, the two least familiar (and that's a good thing) are "Ships Passing Through the Night" and "Crying Blue Rain," both, like most of the album, featuring the original Jimi Hendrix Experience with bassist Noel Redding and drummer Mitch Mitchell. So what's the skinny? Idolatry aside, does this record deliver the goods? Mostly, yes. "Fire," "Red House"—you've heard these before and won't find much new about these versions. But when "new" stuff does pop up, it's inevitable that you'll slide to the edge of your seat in anticipation of what might come from the master. 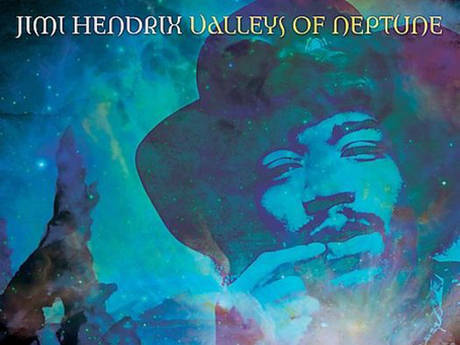 You won't be disappointed—especially on the title track and on the "Sunshine" cover where Hendrix one-ups Clapton. My only complaint about the latter: it's an instrumental, and it makes me long to hear Jimi sing those lyrics that seem so perfectly suited to his time, space, and aura: "It's getting near dawn/When lights close their tired eyes." In fact, this whole record leaves me with a sense of longing. And maybe that's a tribute to the quality of the album: it's a rocking reminder of the magnitude of his talent… and our loss.